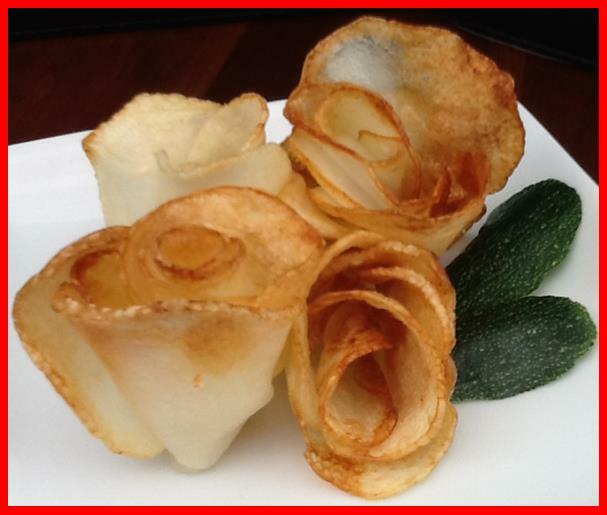 Who wouldn't like this lovely little fried potato garnish on their plate, or on an appetizer platter? We used to place them around a roast but now we place them on our Stuffed Bell Pepper platter, or use them to garnish a warm bowl of Chili or a Veggie Sandwich plate. They take a little practice but are so very worth the extra effort - you do not see them very often. I have been to several other sites to see if there are some new tips circulating that I can pass on to you. One person recommended parboiling the potato slices before working with them. I have not tried that as of this date, but will let you know how that works out when I do. 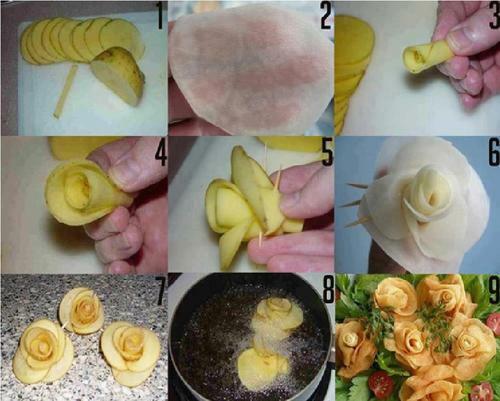 One medium baking potato will yield about four roses. Take the first slice and roll it very tightly. This is the center of the rose. Wrap a second slice around it and then a third over lapping the edge each time. Anytime you feel that you need to secure it, gently push a toothpick in to hold "the petals" together. The following is a picture which I took from DIY Foodie site which shows the steps quite clearly. Heat a good Canola Oil on high until potato slice submerged will sizzle. Just before frying, cut off the bottom, so it will sit flat when done. Now, you can just place two of them in the hot oil, or we held them under with long tongs to encourage them to brown more evenly. Do not be disappointed if they do not look like the perfect rose you envisioned. That takes practice. What matters is that you have made something that most others have never attempted and it will add a beautiful touch to your meal!